Kokoda Fish is a popular snack or appetizer in many Pacific Island nations. 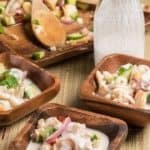 I absolutely love ceviche and kokoda fish is basically a ceviche with a twist. We loved it! This kokoda fish is a little different with the addition of the creamy coconut. A wonderful addition! You can use any type of fresh fish that you love but generally a firm white fish works best for this recipe. You can use either lemon or lime juice to “cook” the fish. I used lemon juice. You will need to plan ahead as the fish should “cook” about 6- 8 hours. If you would like to make this recipe plant paradox friendly, instead of using tomatoes and cucumber use avocado and jicama. Everything else is perfect. If you are wondering what the Plant Paradox diet is, you can pick up the book here. It is a diet I am following and I will make note of the recipes that fit into the diet along the way. This would be wonderful served with taro, sweet potato or plantain chips to scoop up that kokoda fish goodness. Did you know that Papua New Guinea has a tribe called the Kitavans that have a reputation for longevity despite their bad habits one of which is smoking. If you would like to learn more be sure to check out “Our Journey to Papua New Guinea“. 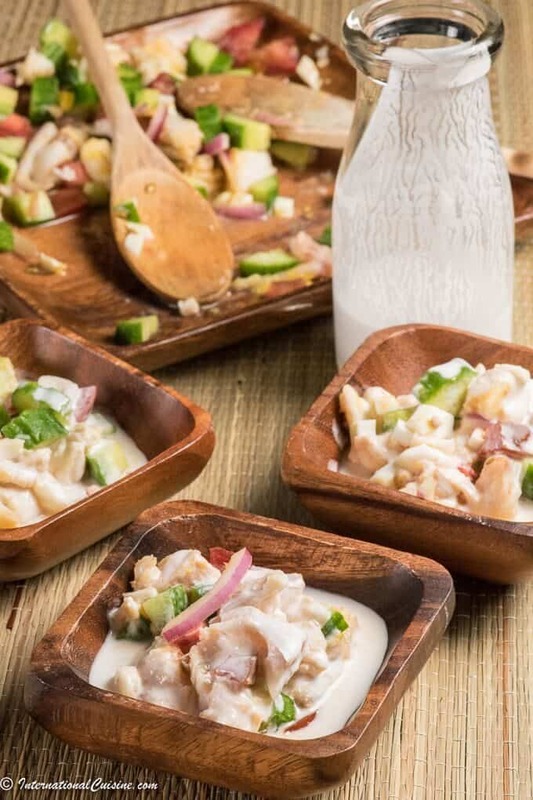 A delicious ceviche style appetizer from Papua New Guinea with a twist. You will love it! Put the fresh white fish pieces in a non-reactive container and pour over the fresh lemon juice. Cover and refrigerate, stirring occasionally to make sure all sides of the fish are cooked. Remove the fish and completely drain the lemon juice the fish was cooked in. Mix the minced garlic with coconut cream and set aside. To the fish, stir in gently the hard-boiled egg, tomato, cucumber and red onion. Put the kokoda fish into four separate serving bowls and pour over the coconut cream. Serve with fried taro root chips or fried plantains for an authentic Papua New Guinean treat!